ABIOTIC are set to release their new album “Casuistry” April 21st on Metal Blade Records. In support of the album, the band will be hitting the road starting this April for an extensive North American tour. 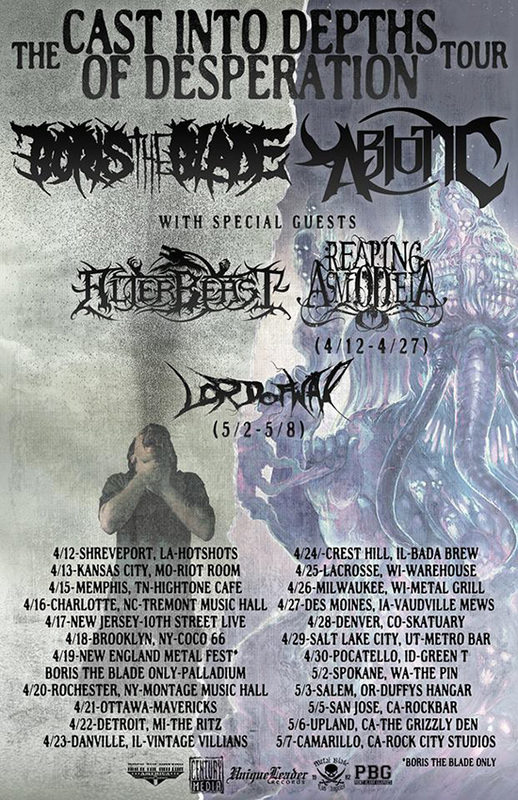 ABIOTIC is heading out alongside Boris the Blade, Alterbeast and more. The tour kicks off April 12th and wraps up May 8th in San Francisco, CA. A complete list of dates can be found below. The first song from “Casuistry” entitled ‘Cast into the Depths‘ which features Dying Fetus front man John Gallagher on guest vocals is available for streaming at http://www.metalblade.com/abiotic. Casuistry is available for pre-order in exclusive bundle packages at the link as well. ABIOTIC signed to Metal Blade Records and released their debut album, “Symbiosis,” which was followed by regional and national touring. Reviews for the album were predominantly positive – Terrorizer Magazine called the record “a monstrously ferocious first full-length” and Decibel Magazine claimed that ABIOTIC “could eventually help propel some kind of post-djent prog bandwagon.” The promotional cycle for “Symbiosis” concluded with a support tour with Dying Fetus and Exhumed. By the end of 2014, ABIOTIC had re-tooled their line up by adding vocalist Travis Bartosek and drummer Brent Phillips. An ABIOTIC record would not be complete without space-y leads and the bands brand of breakdowns. Leads were a major focus for the album. Seven of the nine tracks contain guitar solos from both John Matos and Matt Mendez. And, of course, Alex Vasquez’s bass flourishes can be heard throughout. There’s even a drum solo on “Molecular Rematerialization.” And, as an added challenge for the band to learn to play live, guitarist Paul Waggoner from Between the Buried and Me offered a solo of his own on “Absence of Purity.” It’s all of these elements, flourishes, and individual musical muscle-flexing that gives ABIOTIC their trademark sound.